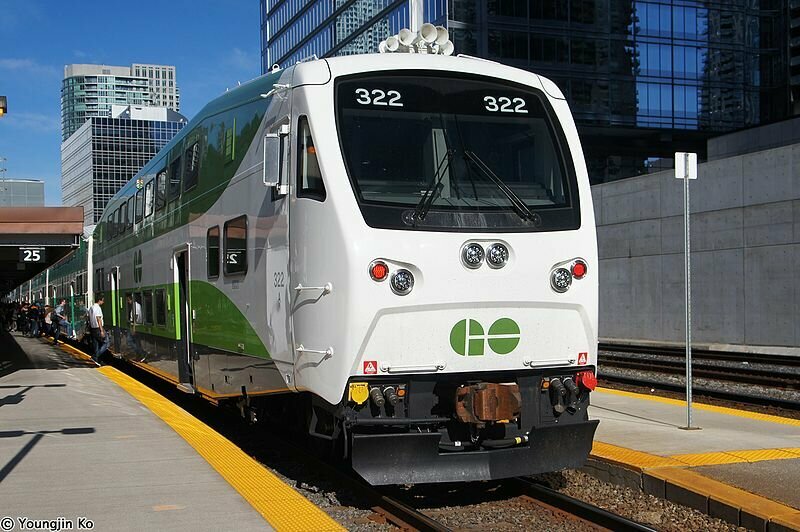 An inter-regional public transit system, GO Transit operates in the Southern Ontario region of Canada. The conurbation around the Greater Toronto and Hamilton Area is its largest service area while services also extend down further to numerous communities around the Greater Golden Horseshoe. Both buses and diesel trains are featured in this transport network which has a connection with some of the other regional transit providers, namely Via Rail and Toronto Transit Commission. The first public transit system of its kind to commence operations in Canada, the first regular passenger service was carried out in the month of May, 1967. Ever since, the network has evolved from a single line system into a seven line rail network with the further inclusion of a complementing bus service. At present, the buses and Metro rail network of the GO Transit system serves as many as seven million commuters in the Greater Toronto and Hamilton Area. The entire network may be covered by a circle of radius hundred-and-forty kilometers with its center at downtown Toronto. The extremities of the service may be earmarked by the following places: Niagara Falls forms the southern border; Newcastle and Peterborough lie to the east; Beaverton, Barrie and Orangeville are to the north while Waterloo and Hamilton border the West. Each of the seven lines or rail corridors depart from the Union Station at Toronto. While the operators have designated colors for each of the different lines, colloquial parlance insists that the lines be referred to by their individual names. The GO Transit buses primarily stand in for the Metro service when it is not in service while also providing a means of reaching the network for those who live far from any of the direct Metro rail routes. The functions of the bus service are not limited as they also provide intra-city connectivity and operate along state highways. There are GO Transit buses running to the airport as well, though it is the seamless connectivity with the Metro service that is most appealing to the commuters. The GO Transit has both metro as well as bus facilities available. The timings for each differ slightly. Each particular route has different timings. The fares on Go Transit are distance based or zone based. Same ticket can be used for travel on a Go Bus or a Go Train or a combination of both. Frequent travelers can use PRESTO CARD which is an electronic card and can be recharged. An Adult Presto card is available for citizens in the age group 13-64 years and full fare applies. A Senior citizen Presto card is valid for citizens over 65 years of age. The fare for a single ride for senior citizen is half of the single ride fare for adult. For children in the age group 6-12 years, the single ride fare is half of the adult single ride fare. Children under the age of 1 year can ride the system for free. One child in the age group 1-5 years can ride free when accompanied by a fare paying adult. Students of junior high, elementary and secondary schools and students of universities and colleges can avail student discounts. Passengers can purchase single ride tickets for travel between two fare zones. A Day Pass can be used for unlimited travel in a day between two specified fare zones. The pass is non-refundable and is valid only for the day of purchase. The price of the ticket is double than what an adult/child would have to pay for a single-way ticket. Group Pass can also be availed for a group of maximum of five people. The pass is valid only for the date of travel. No discounts are available for people travelling with GO Group Passes. There is a special kind of ticket available for those people who have a certain disability and require the support of others. They can travel with an adult with just one ticket but they must ensure to be with that particular adult at all times during the journey. ● Lakeshore West- This line is Eastbound and runs towards Union station. ● Milton- This line is Eastbound and runs towards Union station. ● Kitchener- This line is Eastbound and runs towards Union station. ● Barrie- This line is Northbound and runs towards Barrie. ● Richmond Hill- This line is Northbound towards Richmond Hill. ● Stouffville- This line is Northbound and runs towards Lincolnville. 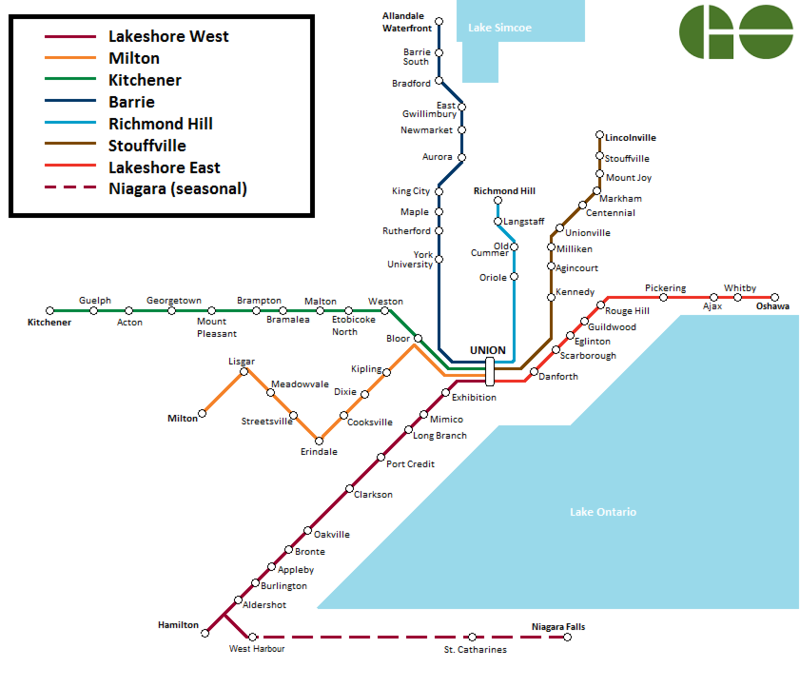 ● Lakeshore East-This line is Eastbound and runs towards Oshawa. Most of the stations, offer parking facilities. There is no such parking fee that is charged, however, the parking is on a first come-first serve basis. One can utilise the parking facilities for a maximum of 48 hours and if need be, a parking space can be reserve/rented as well. It is advisable to stay behind the Yellow Line, for one’s own safety. Avoid crowding up stations, spread out while waiting on the platform for a train’s arrival. Use only the designated crossing, while crossing train tracks as otherwise, it can result in serious injuries. With regards to while travelling in a bus, never chase it, even if you miss the bus. Wait for the next one. You can ask the driver to stop the bus anywhere along the way, as long as it can be safely stopped. However, this request can only be made during the hours of dusk. The GO Transit has a special designated task force, to provide safety and assistance to its passengers. Bicycles are allowed on GO Trains on weekends and public holidays. Non foldable bicycles are not permitted on weekdays during peak hours on all trains that arrive at Union station between 6:30-9:30 am, or on trains that leave Union station between 3:30-6:30 pm.